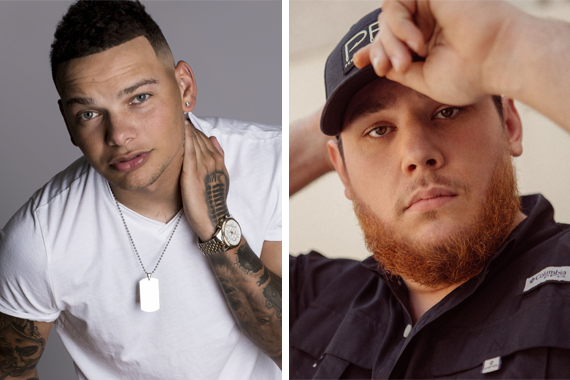 As part of the CMA Songwriters Series, Kane Brown and Luke Combs will perform on a new episode of American Public Television’s “Front and Center.” The taping will take place Tuesday, Sept. 5 at the Franklin Theatre in Franklin, Tennessee. The artists will be joined on stage by a selection of country’s hottest writers for a night of music and stories about some of the genre’s best-known songs. Top tunesmiths taking the stage with Brown will be Tom Douglas (“Cold Spot” recorded by Brown; “The House That Built Me” recorded by Miranda Lambert; “God’s Will” recorded by Martina McBride) and Josh Hoge (“Undone” recorded by Backstreet Boys; “Used to Love You Sober” recorded by Brown; “I’m Comin’ Over” recorded by Chris Young). Combs will be accompanied by hit songwriters Thomas Archer, Ray Fulcher, and Rob Williford, all of whom had a hand in writing on Combs’ album This One’s For You. Tickets for the Songwriter Series show, presented by U.S. Bank, are available for purchase on the Franklin Theater website. Through the CMA Songwriters Series and “Front and Center” collaboration, an array of special episodes have been produced featuring artists like Dierks Bentley, Lady Antebellum, Little Big Town, Jennifer Nettles, and dozens of top songwriters. Each episode features insider stories and explores the passion and motivation that have helped to create some of country’s biggest hits.